Discussion in 'Forza Motorsport 7' started by GTPNewsWire, Jan 15, 2019. This article was published by Kyle Patrick (@SlipZtrEm) on January 15th, 2019 in the Forza Motorsport 7 category. adam thompson, RikkiGT-R and ferhound like this. adam thompson and Nogoodname like this. MalibuClub, palqo and The Chosen One like this. I'm sorry but this is incredibly frustrating to the racers who still play Forza 7. 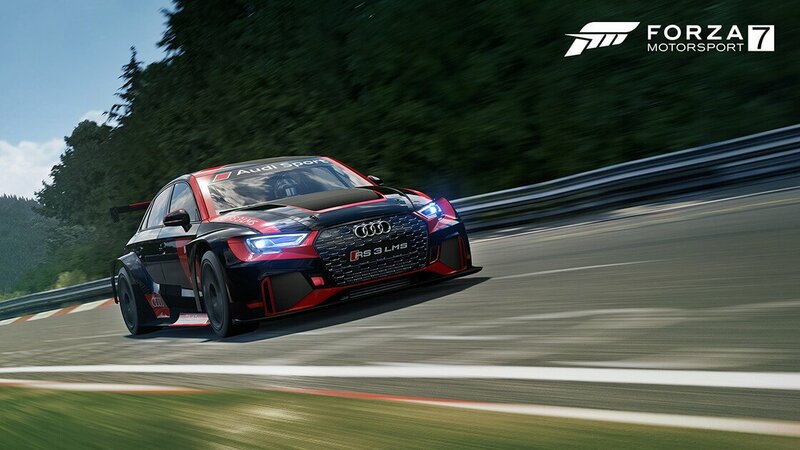 I love the addition of the Audi TCR as I've started following that series very closely here in the US, but the cars that FH4 got, especially the Ford Mustang Fastback, NSX-R GT, 911 Carrera S, and 968 Turbo S, deserve to be driven around in anger on a racetrack as much as they do some B-roads in England. Meanwhile, the Barrett Jackson crap pack we got in Forza 7 needed to be in FH4. What are we going to do on a racetrack with a bubble-top car, a Ford Bronco (most trucks/SUVs are banned from online racing for obvious reasons), and a dragster. The only decent car on paper is the Shelby Monaco Cobra and the Cuda, but the Cuda is a convertible, not even an AAR version. Just purely infuriating at Turn 10's decision making, but that's Forza 7 in a nutshell I suppose. MalibuClub, Cloudy, dissectional1 and 2 others like this. You do realize that the 911 is coming to FM7 as well, right? Where is that posted anywhere? It's only been confirmed for FH4. MalibuClub and dissectional1 like this. And to top off this crapfest, the rivals event for the Audi TCR is at the Dubai Full Circuit, an absolute terribly designed course and not anywhere close to where a real touring car race would occur. I plan to do something with the new cars added to Forza 7, especially for Trackday Online rather than for racing. Imagination works wonders, and that is what I also plan to use once I'm accustomed to these cars. That Audi has to come to GT Sport as well! Dubai in reverse is really better than the normal direction, I like it, and it's fun with a race car. BTW: there was already an Audi S3 touring car... hope this one will handle different. And PCARS. Though I'd be surprised if this car or a future Audi TCR doesn't get added in the next iteration. I like TCR a lot and I like Forza has BTCC cars as well. I just don't have an Xbox. Did the T10 folks tell you that specifically? As for the DLCs - if you all haven't noticed, they've been adding new racecars for free via the monthly Spotlights. Since July, they have thrown in quite a lot of vintage racing metal, and in the last two months they've moved to the latest in GT and touring car machinery with the M8 GTE and now the RS3 LMS. There is no reason to believe this trend will not continue, and T10 has pledged to support the game for a while still, possibly for all of 2019. That would give them plenty of time to shore up their racecar roster, especially if they were to take advantage of their close relationship with manufacturers such as Audi, Honda, Hyundai, McLaren and Lamborghini. It's easy to see why they may not want to add racecars as paid DLC: putting them behind a paywall makes them less accessible to players, and thus, less useful for eSports. The ForzaRC and the Le Mans eSports Series have never used paid DLC cars, and I am sure there are many reasons from the technical to the practical (imagine telling people they have to pay to practise for an invitational event?) for this. It also makes sense, for the same reason, to stick the "gimmick" cars to a car pack coming this late to the game - since nobody but vintage hot rods fanatics and Car Pass holders will be getting this anyways. 'sides, the Bronco may be out of place, but I feel the hot rods belong here, and on the drag strip, more than they do on Horizon. My impression is whereas in Horizon they're kinda forced to be more picky with the car roster (since is has a big difference in the car count vs FM7) which forces them to "thin the herd" a bit, effectively making most of the better cars in FM7 make their way to FH4, FH4 is also getting more interesting car additons (most obviously the 992 of course) imo, if not for anything because all the 911 FM7 has are either a GT variant or a Turbo variant. FM7's car roster is bloated with rather pointless/gimmick cars (like the offroaders or those hotwheels or those hoonigan cars). Why the hell include offroaders on a game that has nothing even remotely close to rally in it? It's totally pointless. At least the other ones, regardless of how uninteresting I may find them, might please the tuner crowd (with the hoonigan cars ) or yank a few laughs out of some people (with the hot wheels cars) but it feels like there's no real criteria in the car selection, because well FM is supposed to have the numbers so lets pack it full and to hell with it if the cars are crap or not. And as far as the eSport shenanigans, The game has plenty of race cars for them to use for those things. I'd rather have a modern road car than that BMW M8 race car, for example. Honestly, in most cases, I don't really mind the... let's call them "unsuitable" additions. I like comparing two unlikely vehicles, so if that means taking the new Cayenne around a track to see what actual sports cars it's faster than, that's entertaining to me. The weirdest one though has to be the Nissan Safari. That was such a bizarre addition to FM7, and so far it's absent in FH4. The general line of thinking was it was added in preparation for the open-world game, yet that hasn't happened. And yeah, count me amongst the folks disappointed the 992 didn't come to both titles. There's form for it too, since Turn 10 added two Porsche spotlight cars last summer, and one was a road-going 911. And as far as the eSport shenanigans, The game has plenty of race cars for them to use for those things. I'd rather have a modern road car than that BMW M8 race car, for example. The hoonigans are perfect for drifting, I use them for that, as I've no will to make a drift car out of a perfectly goo race car. I disagree on race car vs road car: it's a track game, and I think race car often are much more enjoyable. There's a lot of race car you say? there's also a lot of road cars. The Chevelle BJ is a good car in B Class. The Bubble Top is a good car in B Class. The Ford Roadster is a good car in C and B class. The Ford Bronco is a beast excel car in C class if you have the throttle control. The Cuda is a very good car in C class. If you can't make these cars win races, then you are not building the cars correctly. Just because you can't use your cookie cutter S2000, 97 Civic build and tune on a car, does not make it a "joke". I wouldn't be surprised if on a future update FM7 got a pack of "turds on wheels" and FH4 will be got stuff like the Aventador SVJ, the Mclaren 600LT or even some cool car from the FM4 era. I hate saying this but this car drives really nice. It does not feel very "FWD" until you push it too far. I actually enjoyed lapping this thing and I hate FWD cars as a rule.